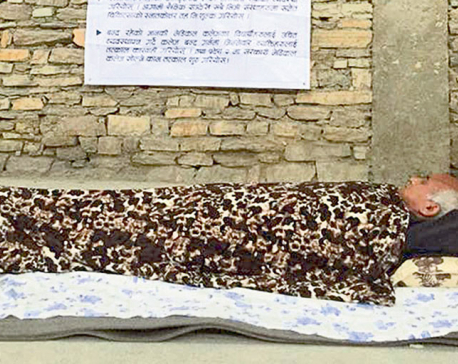 JUMLA, July 14: Dr Govinda KC, who has been staging a fast-unto-death here since the last 14 days demanding reforms in medical education, has started having spells of unconsciousness. Doctors involved in his treatment said a problem is seen in blood circulation in Dr KC’s brain time and again. “He is often losing consciousness in the night. 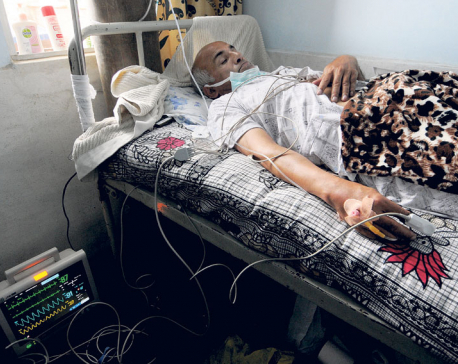 It’s been difficult to tell whether or not blood is circulating in his brain round the clock,” Dr Jiwan Kshetri, an aide of Dr KC who is also involved in his treatment, told Republica. The level of glucose and oxygen in his body is decreasing. “Lack of glucose and oxygen has caused some complications in the supply of blood to the brain,” said Dr Kshetri. Apart from this, Dr KC has complained of dizziness, stomach pain, urinary infection and weakness. 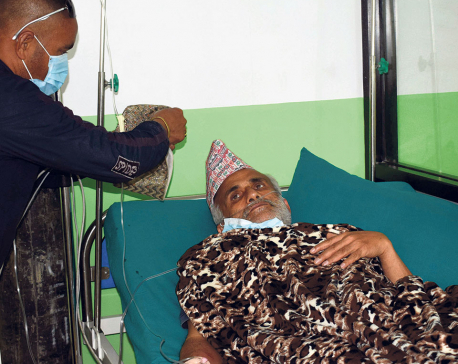 Doctors stress the need to take Dr KC into ICU. He has, however, been refusing to go to ICU. Despite Dr KC’s worsening condition, the government seems indifferent toward addressing his demands. “As of now, the government has not shown any interest in holding talks with us,” Dr KC said. Nepal Medical Association and other concerned organizations have urged the government to initiate talks. The government, however, wants to airlift Dr KC to Kathmandu, with force if necessary. News that a helicopter would arrive to airlift Dr KC to Kathmandu spread like wildfire in Jumla on Wednesday. With the aim of bringing Dr KC to Kathmandu, a government team was said to be preparing to leave for Jumla, but it could not do so after the crusading doctor refused to be moved. That news made the rounds on Thursday also and it has created panic among the locals. 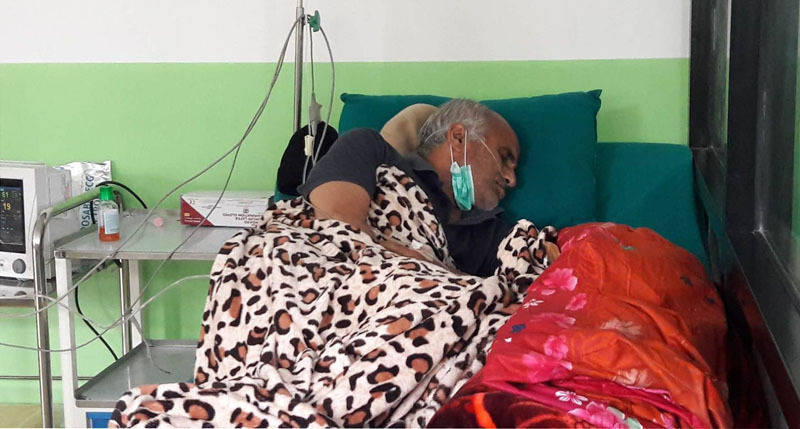 “For us, Dr KC has been no less than a god,” said Jumla local Kanyalaxmi Sunar who was seen on the premises of the Karnali Academy of Health and Sciences. People in Jumla have to struggle a lot for lack of medical facilities. “Most health posts situated in the remote areas only provide medicine for common cold and fever. As we don’t have money to go to a well equipped hospital, falling seriously ill means a sentence of death for us,” said Kanyalaxmi. Jari Kami of Chandannath Municipality, Amkhola, has heard about Dr KC’s latest fast-unto-death in Jumla on the radio. He knows that Dr KC’s crusade is for better medical care for ordinary people and news that the government is trying to take him back to Kathmandu against his will has saddened him. “What does our government do but jail good people and cuddle the bad ones?” he fumed. He urged the government to address Dr KC’s demands as soon as possible. Locals are worried that there will be no one to speak for people like them in Karnali if Dr KC is taken back to Kathmandu. Dr KC has been adamant that he won’t leave Jumla unless his demands are fulfilled.